"figure storiche del panorama concertistico internazionale, la stella del violinismo mondiale"
FELIX MENDELSSOHN: Concerto in Re minor for piano, violin and strings. "Last Night of the Thurn and Taxis Proms"
R. WAGNER Ouvertüre "Der Fliegende Holländer"
15.02.2008 - The Mall at Cribbs Causeway, Bristol POSTPONED!!! 18.09.2008 - Dreamball - Germany; Berlin - Benefiz Gala of the DKMS VIP: David Garrett!!! 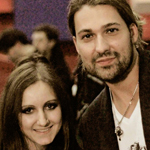 Germany: "A very special evening with David Garrett, begleitet von Milana Chernyavska"
Девочки, просьба ко всем - покопаться на ютубе с целью найти видео с 2007 и 2008 годов! Спасибо!